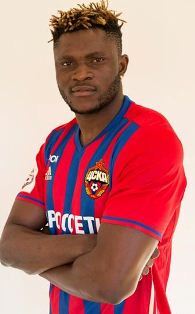 Aaron Samuel has completed his move to Russian champs CSKA Moscow after putting pen to paper on a four-and-a-half-year deal that ties him to the club until the end of the 2020-2021 season. For the remainder of the season, the former Sarpsborg 08 FF and Guangzhou R&F star will suit up with the number 99 jersey. Explaining the rationale behind his choice, Samuel said to CSKA TV: “99 - that’s my favorite number, I played under it since childhood and always dreamed it is that I have. The 22-year-old striker joined CSKA Moscow at their training camp at Campoamor on Saturday.